Health care isn’t exactly known for its efficiency, but a new analysis from PricewaterhouseCoopers puts the value of the waste sloshing around in the system at a whopping $1.2 trillion a year. That’s right. 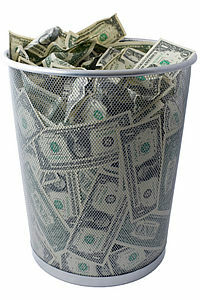 Trillion–with a T. The findings of the firm’s Health Research Institute suggest that up to that much “wasteful spending” could be going on, more than half the $2.2 trillion spent on health care in this country. including ineffective use of information technology ($81-$88 billion), claims processing, ($21-$210 billion) and defensive medicine ($210 billion). Medical errors cost $17 billion and badly-managed diabetes is tied to $22 billion. the analysis adds to a growing pile of other research (including the granddaddy of the genre, the Dartmouth Atlas of Health Care) focused on unnecessary health-care expenditures.